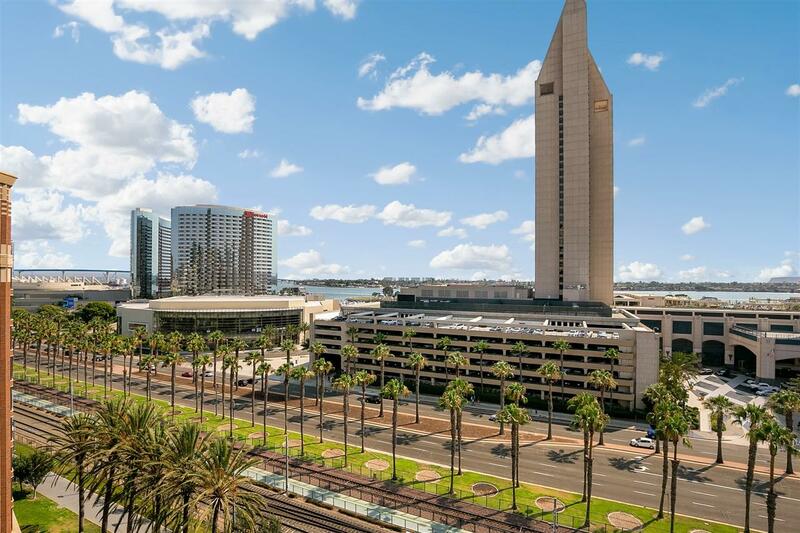 Spend each day drinking in views of the Bay, City, Coronado, Point Loma and Coronado Bridge, panoramic water views from every room! Prime South facing with great natural light. Both master bedrooms are en-suite and on opposite sides for total privacy. The open floor plan boasts of upgraded travertine flooring, paint, while granite counters and stainless steel appliances create an elegant kitchen space. Exquisite community amenities will spoil you with 3,500 sq ft Fitness Center, Sauna, Spa/Hot Tub, A lap Pool and a Recreational Pool, BBQ, serene courtyards, optional valet parking, and 24 hr Concierge. Fast, and convenient, access with no steps. Eight elevators - Pets even have their own elevator and a huge lawn area to frolic on and make friends. 1 underground parking space and an additional 4x4 storage unit come with this unit.